380cc cartridges - to fit a standard Skeleton Gun, supplied with our special extended nozzle. Accessories Pack includes Professional Drilling Template, Product Guarantee Certificate (generic), BBA Certificate (photocopy). Option - purchased our unique Calibrated Skeleton Gun for zero waste and assured results - click here. Professional Drilling Template - printed on thick card. 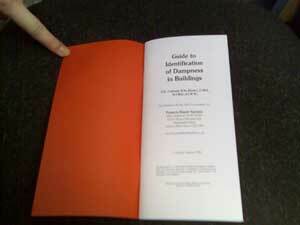 Dampness in Buildings - Coleman - a reprint, to guide you in diagnosing dampness. A unique, easy to read Guide - explains everything you'll ever need to know about dampness in buildings. Call us for more sizes. Essential to blow dust out of the holes. 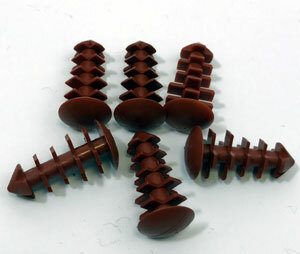 Plastic Plugs for hole filling. Three colours are available. 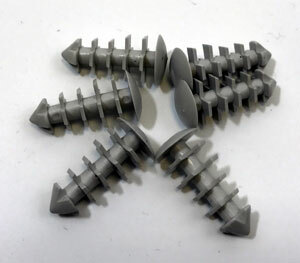 Uses - for capping holes drilled in wood or masonry. Colours - Cement Grey, Brick Red, Stone/Cream. Frequently purchased with our 10mm and 12mm Masonry Bits and 10mm and 12mm Wood Auger Bits. Professional quality - for 310cc and 380cc tubes. Optional - calibrated gun, no waste. The Calibrated Skeleton Gun produces an exact amount per normal trigger pull, enabling anyone to accurately inject a hole with damp proofing cream. Kit includes Replastering Additive for the Render backing coats (2.5 litres), Boron Gel (500cc) for treating the back of skirting boards, Replastering Paint (2.5 litres) which breathes and Anti-Mold Additive (2 x 50cc) to prevent mould growth in your new paint. Renderproof - concentrate for sand and cement plaster/render - add water at 40:1 - 2.5 litres for 10 square metres, 5 litres for 20 square metres. Replastering Paint - For use after replastering, either with sand and cement backing coats or normal, lightweight Gypsum plasters. This paint is special - it breathes - allow water vapour to pass through. The walls dry out properly and the paint does not bubble or lift off, as a regular vinyl paint might. It is also an Anti Mould paint, actively preventing the growth of surface moulds, such as Black Spot Mould. 1000cc cartridges - to fit a Jumbo Skeleton Gun, supplied with our special extended nozzle. 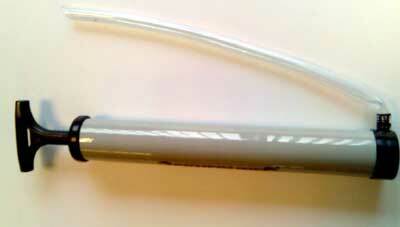 Skeleton Guns - professional quality - for 1000cc tubes. 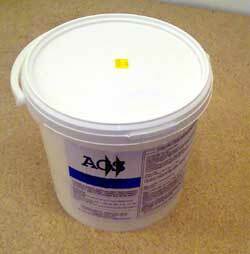 The 3 litre bucket of Damp Proofing Cream contains a sealed plastic bag, for extra security in transport. Shows drill height for DPC, drill spacing and replastering specification. 20 Year Certificate for UltraCure Cream - excludes workmanship. 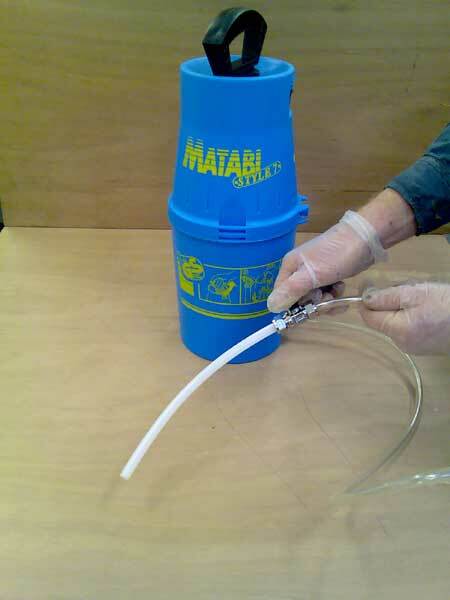 Puffer blow out pump for holes - removes dust prior to injection. 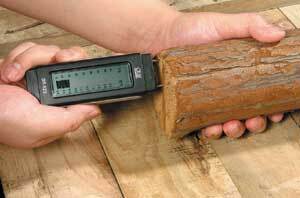 with Timber and Masonry digital scales, battery and calibration test facilities. 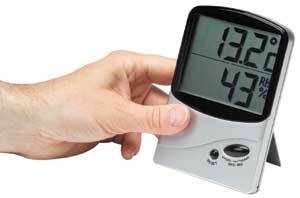 Handy Hygrometer for measuring Relative Humidity and Air Temperature. This allows you to prevent Mould growth by either regulating the heating and ventilation, or by adjusting your Dehumidifier. A vital tool for assessing the risk of Condensation. 50 pages of solid information in an A5 format. Become your own Expert in 1 hour! Buy our "Dampness in Buildings" reprinted book by national dampness treasure, Graham Coleman. A great read, short and to the point. A special white universal surface primer designed to seal areas of plaster or render that have been stained by 'salts', damp or water leaks. This fast drying primer is the ideal base for emulsions and gloss paints and prevents unsightly stains from 'grinning' through paint finishes. Use outdoors or indoors - one pack. Ultra strong damp proofing rubber membrane, applied by brush, available in black and white. Perfect for sealing walls partly below ground, external walls below the DPC and to seal damp concrete floors. 5kgs covers about 20 sq. metres on a smooth surface. 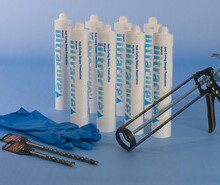 Can be used under plaster or a screed to provide a damp proofing layer. 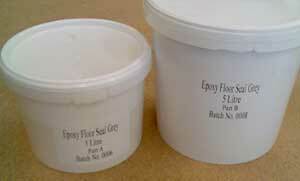 Ultra Epoxy Seal Coat Paint - use indoors only - two pack. Ultra Epoxy Seal coating is perfect for sealing damp concrete floors, damp screeds, damp slab and tiled floors, to prevent the passage of moisture and moisture vapour. 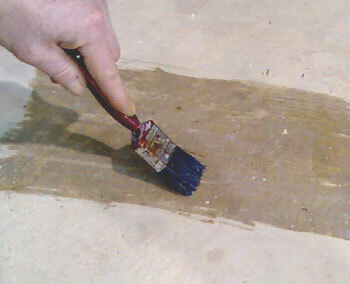 Can be used to prepare old or new concrete or screeded floors for direct laying of wooden floors. It acts as a complete vapour barrier. Allow for two coats minimum. Cover the top coat, whilst wet, with dry gritty sand to give a key for adhesives. Kills 'salts' in walls. 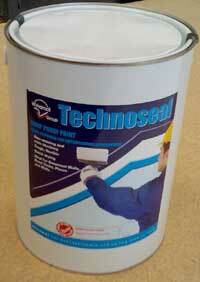 Can be used on bare masonry, bare render or bare plaster - will not penetrate paint. Usage rate: apply with a brush at a rate of 5 - 10 square metres per litre, depending on the roughness of the surface, twice. Damp the wall with fresh water before each coat. 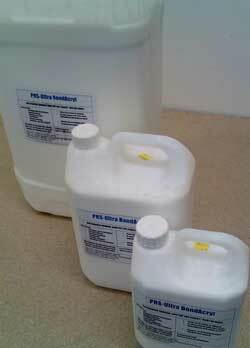 Coverage - allow 5 to 10 square metres per litre, depending on wall roughness. 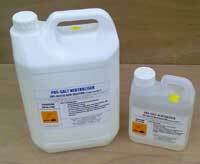 Water based, acrylic layer forming water repellent for wall and floor treatment. Repels water on outside walls, prevents dusting on concrete floors, primes and seals all types of plaster, render, brickwork and stonework. Can be over-painted or applied over paints, to lengthen life and reduce dirt build up. No solvents, no smell. Can be applied to a damp wall. Usage rate - allow up to 4 square metres per litre, by brush or low pressure, coarse spray. Ideal for spraying UltraProof, or general DIY tasks. A powerful cream containing Silane. As opposed to conventional liquid products, DRYSEAL can be applied in just one working operation to achieve the desired loading for maximum effectiveness. Dependent on porosity, the effective siloxane ingredient penetrates the substrate within a short time (30 minutes to several hours) where it reacts to become a polymer silicone resin. 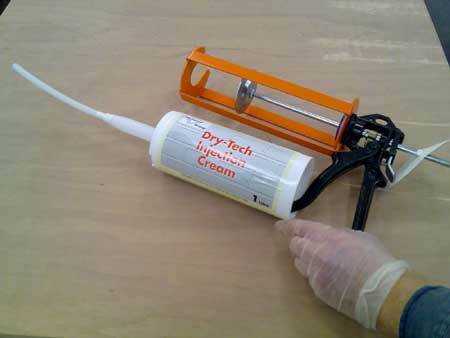 Brushing Dryseal - shows 'white' initially then clears. Usage rate - allow up to 4 to 5 square metres per litre, by brush, up to 15 square metres per tub. 1. 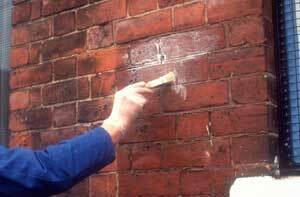 Bonds a repair mortar (sand and cement) to old concrete or render, when used as a primer. 2. Makes a sand and cement mix waterproof, when used instead of water. 3. 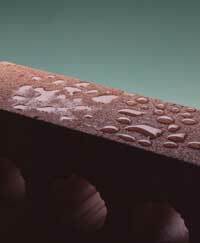 Allows 'screeds' to be laid much thinner than normal - down from the normal 50mm minimum to 12.5mm thick. 4. 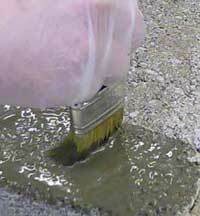 Reduces shrinkage and the risk of cracking when used in sand and cement mixes. Usage rate - see our guide in the Data Sheet - click here. Replaces sand and cement render after the insertion of a Damp Proof Course - special 1 metre roll cut to size. Only 3mm thick. 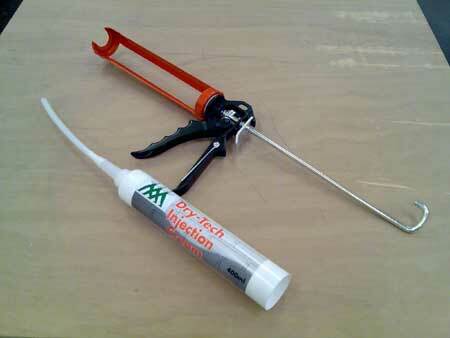 Plaster or fix plasterboard with adhesive. Also available in 2 metre widths, 3mm or 7mm thick. Call 01626 331351 for help. 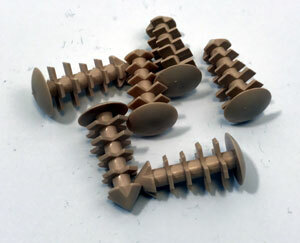 Fix with bang in plugs, then Plaster or Plasterboard. 20kgs - Professional with BBA Certificate, in a tough plastic pail - just add water. 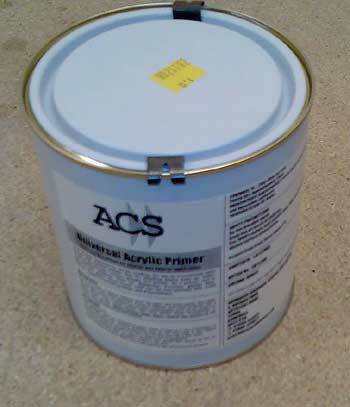 For coating concrete, brick and stone walls and floors. Apply with a soft brush - wall paper type or from a dustpan and brush set. Universal Joint Filling Mix - Fillet Seal for the floor to wall gap joint. Leakstop - Hydraplug, for instant leak and weep sealing. PRS Calibrated Skeleton Guns have been specially modified to limit the amount of cream that is pumped with each pull of the trigger, for one shot, precise Damp Proofing Cream injection. The benefit is that Damp Proofing Cream can be accurately dispensed into the 12mm holes, avoiding waste and excess cost. Note - all products are subject to delivery charges according to weight and volume, plus VAT. We do not guarantee delivery times or dates, although every Order received by 2pm is sent out the same day and goods usually arrive on the Next Working Day, for the majority of Mainland UK Postcodes.